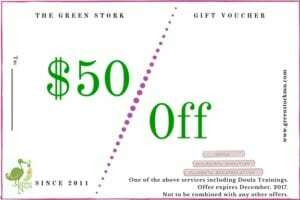 The Green Stork gift certificates are a perfect way to support a new mom as her family grows. It’s a gift of support that she will treasure and remember forever. Available in any amount, these make the perfect gift for a baby shower, Christmas or even a birthday present. It’s a perfect way to support a mother or couple in the birth experience they desire. Mailing address if certificate is being mailed. The Green Stork will send you a Pay Pal invoice to be paid in full before the gift certificate will be sent. We request 3 business days to invoice and 2 business days to ship. Please let us know if you need anything differently.